Seco South’s Stainless Steel Cable Trellis System 2000-60 is a trellis system that suits foliage applications such as jasmine, gardenia, rose bushes, climbing roses and other similar weight plants. The stainless steel standoffs that mount to the wall are almost invisible when the foliage is in full bloom. The simple attractive design details are beautiful when visible due to young plants as well. The stainless steel wall mount supports the foliage four inches from the wall or structure. The 2000-60 Stainless Steel Cable Trellis System is ideal for residential or commercial installation. 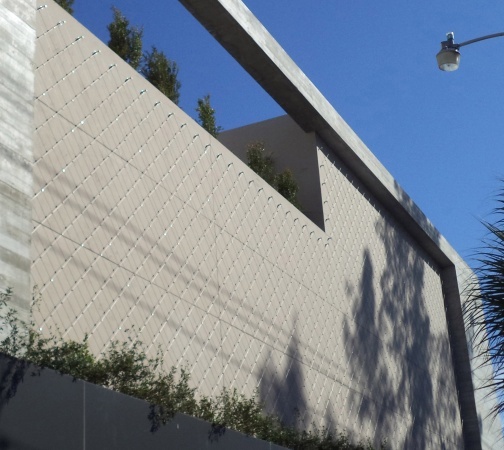 Create a living wall in a garden, outdoor restaurant, downtown business district or other locale by installing the stainless steel cable trellis system between two structures. Plant a climbing vine in the ground near the trellis and train the plant to climb the cable trellis system. The system can be utilized in both tropical and moderate climates.